CORRECTION 18 October 2013: The 2008 total shown in the graphic is incorrect. 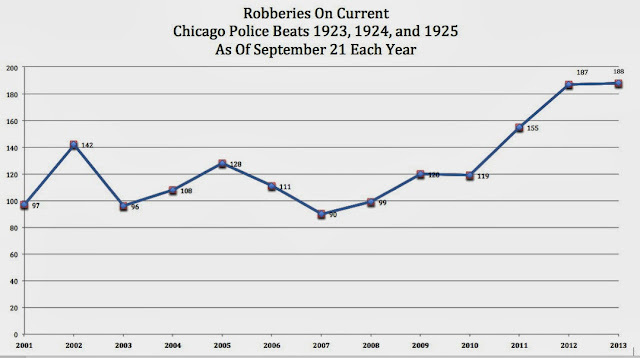 There were 120 robberies as of September 21, 2008. As we roll into the first of October, CWB is giving our Daily Ticker the day off. In lieu of the ticker, we've put together this less colorful line graph that shows how many robberies our neighborhood had experienced as of September 21 in each of the past 13 years. 2013 is essentially flat compared to 2012, which was the worst year on record. There are signs of a better effort being made by the police department to inform the public about the problem in our neighborhood. Only a complete, long-term commitment with greater resources than are currently deployed will get this line back to where it used to be. Lord knows, we've seen half-hearted efforts that quickly fade away before. Let's stay out of the time warp this time. Statistical stuff and data sets are below. We always provide online access to our data sets, which are sourced at the City Data Portal. Details are provided for every crime, including dates and addresses rounded to the 100 block. The data set used to create this graph is available for your review here.